We didn't eat out a ton in my family growing up, so when we did it was always a special treat. I have fond memories of when my Dad would surprise us by coming home from work with a big white paper bag filled to the brim with hot dogs from the Roanoke Weiner stand. I think it's where I first learned to love hot dogs topped with mustard, chili, and onions, because even today this is my preferred method of topping a hot dog. 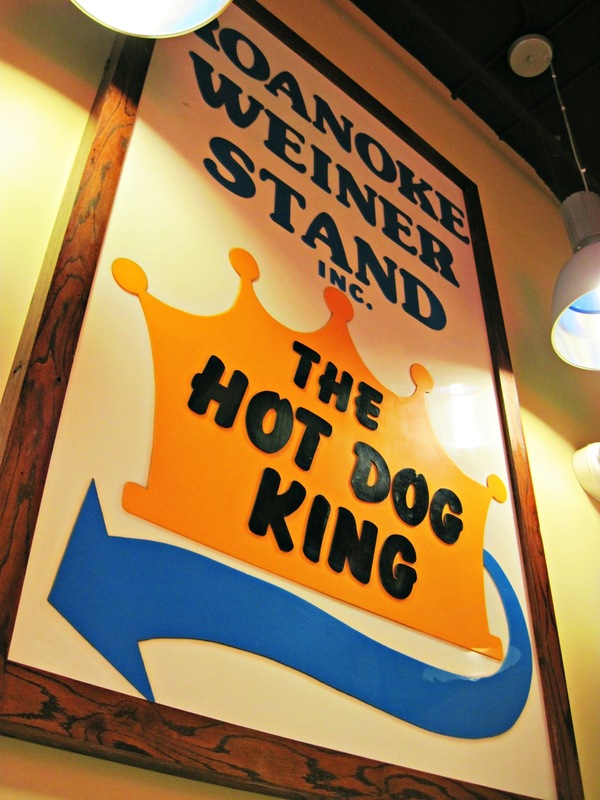 The Roanoke Weiner Stand in downtown Roanoke has been around since the mid 1920s. 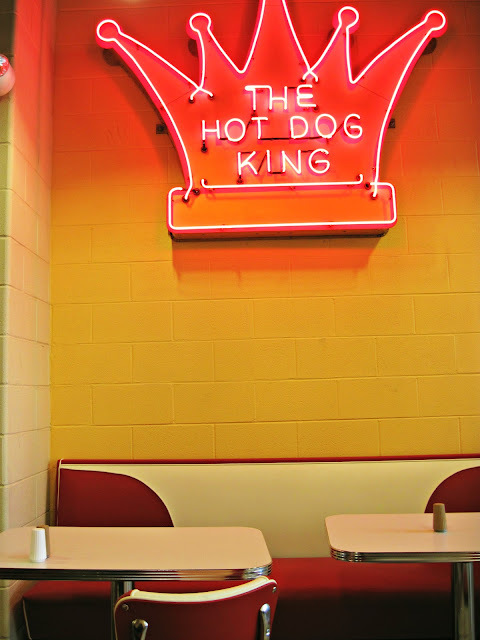 I remember years ago when Paul and I first moved to Roanoke from Houston, we took a break from unpacking boxes to head downtown for the beloved hot dogs that I remembered so well from my youth. 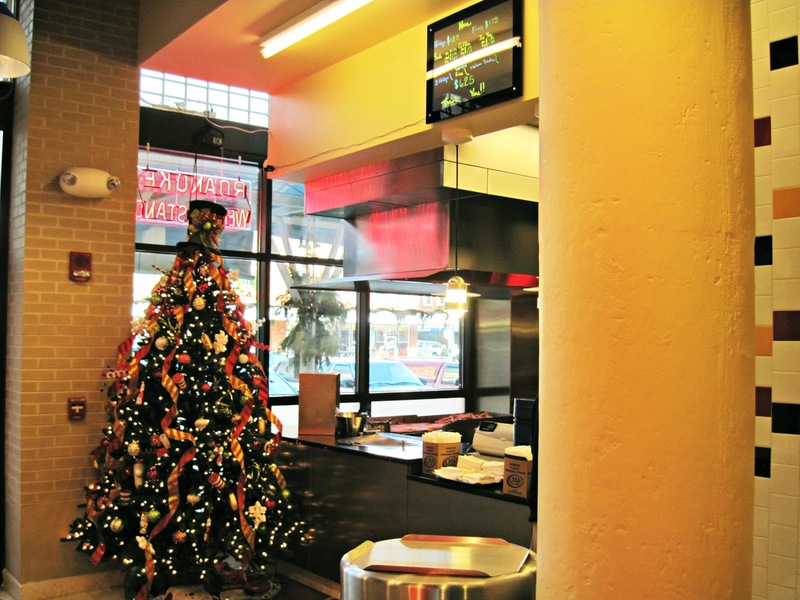 When they recently started renovating Center in the Square, the Weiner Stand closed briefly. It was missed by many locals. Now, it has reopened, and in a new spot, just a couple of storefronts down from the original. The new location is brighter and shinier, and the only thing missing are the old black and white photos on the walls (I read in the paper that these will eventually be rehung). One thing I love about the new location are the tables and booths. Often in their old spot, there was nowhere to eat. Now, the Roanoke Weiner Stand is much more family friendly. In fact, Paul and I took the twins there for lunch. While they didn't go for the chili and onions on their hot dogs, they certainly did enjoy theirs with mustard and ketchup. As for me, I was thrilled to order my usual "all-the-way" hot dog. I love their zesty chili. And the fries are just the right crispness. While they are lacking in salt to my Southern tastebuds, they handily provide salt shakers on the tables so that you can salt to taste. In fact, my only disappointment in the new location was that there weren't many folks there, even though we were there during the lunch hour. Perhaps not many people have realized they have reopened. Hopefully they will see more business soon. How about you, readers? What restaurant do you remember fondly from your youth? Is it still around? I've never been there! But they do look Yummy! Hi Lisa, I really enjoyed this post. The twins are so cute with their hot dogs. What neat memories from your childhood, too. As a child, my family would visit The Varsity for chili dogs heaped high with onions! Hope you have a great day. A & W root beer (and hot dog) stands and Square Donuts. Whilst I haven't seen an A & W for years we still have the Square Donut place....Krispy Kreme, etc... have nothing on them! We had a little shack of an ice cream shop that is a fond memory. It's still there, but it's not the same name or same stuff so basically it's not really still there at all. Your spicy chili on your dog looks good! Lisa -- you are so funny! I'm heartened by the fact that although you are usually so health-conscious when it comes to food, you and your family can enjoy a good ol' American hot dog. Yay! They look awesome. Oh my gosh!! It has been so many years since I have had a hot dog. Seeing your son eat them makes me so hungry for one. OMG it's 7 a.m. and I am craving hot dogs! We used to go to an old gas station/general store called Thelma's for ice cream. This may sound weird but I've always loved gas station hot dogs. the ones that rotate in the thing I can't spell haha. There's a place here called Big Freds. It's a pizza place. They ground their meat down. It tastes really good! I love the pictures of your twins eating their hotdogs! actually, we have a hot dog fast food place back home called "weinerschnitzel" it used to be "der weinerschnitzel" but for some reason over the years they dropped the der. they used to have really neat a-frame drive thrus but then for some reason changed them all to look like every other fast food spot. but i remember as a kid, we'd pick up a bag or two of mustard dogs, ketchup dogs, kraut dogs and chili dogs and take them to my grandpa and grandmas house...i loved that! What fun to have a retro place reappear! We had a walk-up Dairy Queen window...dilly bars! I've never eaten there, but I have a feeling my husband would love the hot dogs. When I was little, there was a restaurant called Jack's Place in the nearby village. It had the best hot dog slaw. Pizza King pizza in my little town. To this day I still remember how it tasted and it is the best pizza I have ever had! Lisa! (haven't been to my box yet but i'll be going later today) i'm lazy today cuz was up late learning my new New camera! Yahoo! while comp is down i'll take new photos. I'M SO EXCITED!!! Got a SONY cyber-shot again. Is AMAZING Camera! the Auntie Freeze is gone (tasted similar to IN N'OUT that i love today) and that other place i forgot the name, but every once in a while when my husband makes breakfast i can smell those same aroma's that place had. My family was the same way-in that eating out was a special treat we didn't do very often. Peaches Hot Dogs!!! But then he retired and Phil never found another hot dog stand as good. Not even Sam's. I think he might go all the way to Roanoke for this,no kidding! 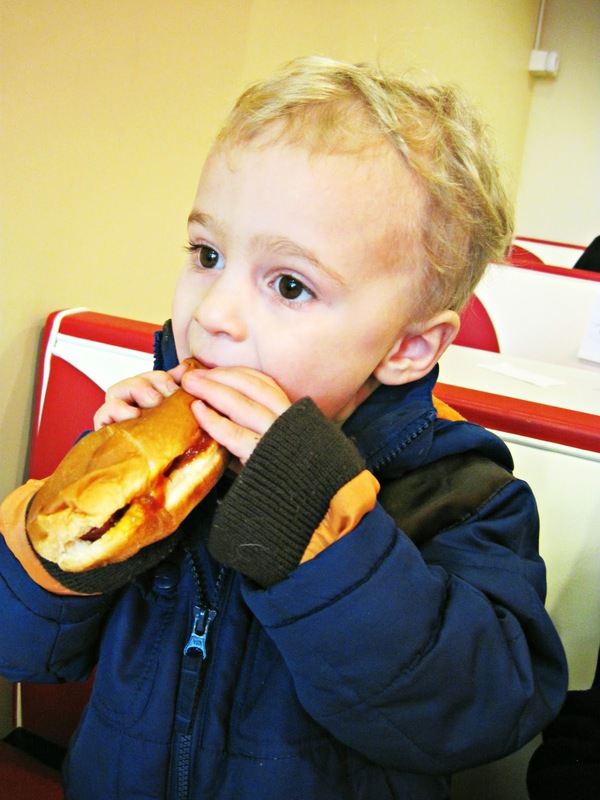 Hot dogs are one of his favorite things in the world! LOVE your pictures of the boys enjoying them, also your yummy close up!! Are you taking the boys to Hotel Roanoke this year? Most of my tree pictures will be from there, a few years ago. I hear they have more trees than ever this year, dozens and dozens. Themed and for kids, it is a fabulous place to take kids! YUM! Sounds like the place to eat with the King! Happy Holidays?! 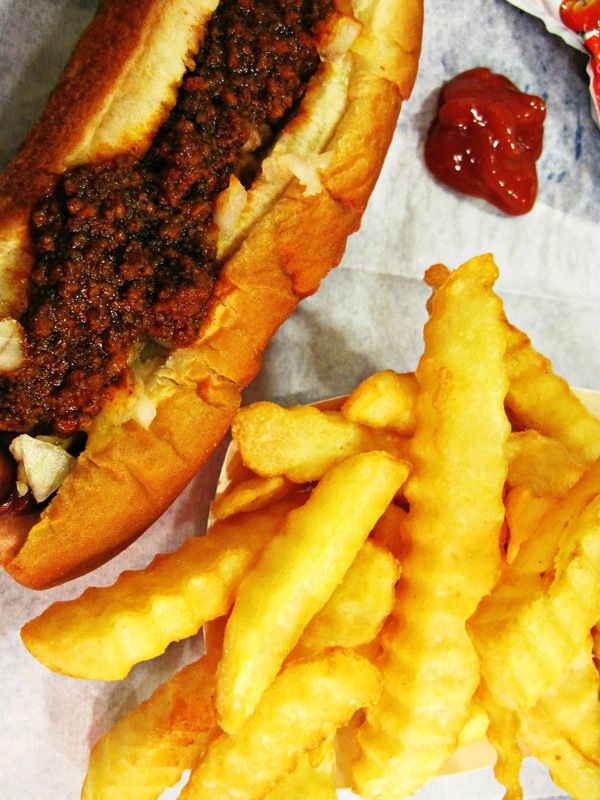 Nothing better than a good old chili dog with onion! It's nice that you're once again able to enjoy that treat,Lisa. Ever heard of a Chicago Dog? My dad was in the service and we didn't have a lot of money growing up. But we did go to two places I remember- McDonalds and Shaky's Pizza Parlor. I think burgers were a quarter back then! 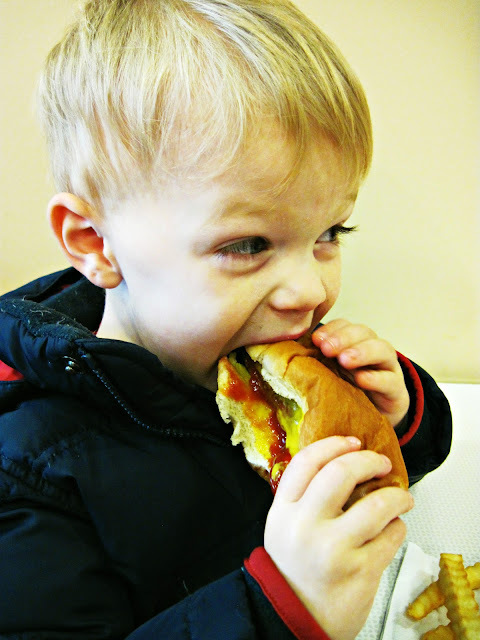 Looks like the kids are having a good time trying to get the hot dogs in their little mouths! I recall that my grandparents took our family out to dinner every now and then so that we kids would learn how to behave in a restaurant. We would go to a family restaurant where our giggling would not bother other diners. I especially liked the chicken pot pie! Lisa: This is the first time I've ever seen another blogger write about Chili on Hot Dogs in buns. I hail from Cincinnati, where Skyline Chili is a favorite at the airport for Nick Lachey or Martin Sheen, (Cincinnati and Dayton)fly in. The chili is made with Cinnamon and Chocolate with spices and is good, but a lot of calories! I enjoyed reading about the restaurant coming back bigger and better! I've walked past a couple of years ago to get photos of it... Love their sign, but never went inside. Probably wasn't lunch time. Love how your boys are enjoying the hot dogs! pizza was a favorite. My dad had a place near work and they would send him home with all the fixing and we would make the pizza at home.